Rain tap-tap-tapping on our tent woke me this morning, bright and early. So early, in fact, that while I really wanted to make a trip to the bathroom building, I didn’t feel like dealing with the dogs. And when we’re up, they’re up. So I tossed and turned for a while trying to convince my bladder that I was still asleep, until I glanced over and saw Kay doing a similar dance and gave up. By then it was around 6AM. We took turns wandering off to the bathroom building, since we had only brought one umbrella and the rain was coming down pretty steadily. And then Kay, being the trooper that he is (and the second one to go to the bathroom – hence he was already out of the tent with the umbrella) walked the dogs. And when he brought them back, we discovered how woefully inadequate our little REI pack towels are for wet dogs. And how quickly the smell of wet dogs permeates a tent, however palatial. Putzed around re-packing things in the tent for a while in the vain hope that it would stop raining. The weather radar LOOKED like the rain would end in 10 or 15 minutes… for 2 hours. By the time 8 AM rolled around, we’d re-packed and re-arranged everything we could, and we’d torn down everything short of packing out from the tent. I volunteered for that duty, since I’m better at tetris-ing things into the panniers than Kay is. And then there was nothing left but the tent full of two dogs, a Kay and our motorcycle jackets. And it was still raining steadily. 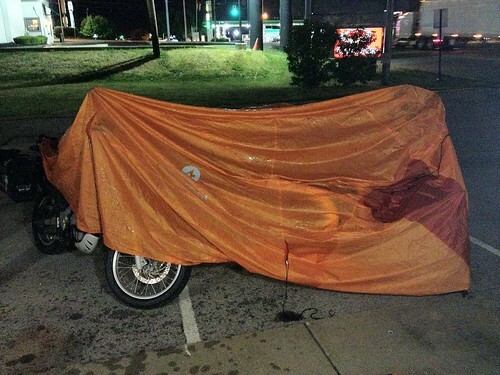 We bundled the dogs directly into the sidecar where they could stay dry under our nifty custom cover. And yes, it was dry! They patiently waited while we tore down the tent, and packed it wet, since we couldn’t really do much about the rain. And then they waited patiently while we packed out the garbage and left the campground. And waited patiently some more while we rode to the gas station, gassed up and put air in the rear tire of the Ural, since we didn’t feel like tearing everything apart to get to our Cycle Pump in the rain. And then we were off! Sadly, in spite of our intention to get an early start, it was nearly 10 AM by the time we were packed, gassed and ready to ride. We rode for a while. The GPS routed us on state highways that were quite pretty, for a while. We rode through a part of New York that was hilly and verdant, with speeds in the 40-55 MPH range – which is exactly in the Ural’s wheelhouse. The morning passed pleasantly, but by 11:30AM, we still hadn’t had breakfast and the Ural wanted more gas, so we stopped at a gas station that claimed to have food thinking we’d grab something and get back on the road fairly quickly. It just reminded me of some of the things we encountered in South America where we felt people were being exploited… Bob was telling us that some of the stuff went into practically everything, from plastic to pieces of the motorcycles to… pretty much everything. I felt a little disgusted thinking about how consumer-driven our society is, and how our need to constantly “buy, buy, buy” stuff supports this type of exploitation and depletion of our natural resources. All so someone can have a plastic bottle of water. Or an XBOX. When we first got back from the trip, we were pretty anti-consumer. We got rid of a bunch of stuff. But in the past year, that attitude has shifted again and we’ve gone back to accruing stuff. At least this time, it’s motorcycle and travel related… but it reminded me of how easy it is to go back to one’s old ways and lose awareness of things like this going on all over the world. Not just in South America, but right here in Pennsylvania. Anywho, by the time we were done chatting with Bob, it was 12:45 and we’d barely made it 80 miles. It was time to make tracks. We were heading for a campground that was 385 miles from where we stayed last night, so we still had 300+ miles to go and it was almost 1PM. That did not seem good. The rest of the day was spent going in and out of rain bursts. For a while, it was pretty. The mist was light so the moisture wasn’t too bad, but the steam rising from the hills around us was just beautiful. I enjoyed it. I would vastly prefer that type of day to 100+ degrees that we’re anticipating when we get out to places like Nebraska. 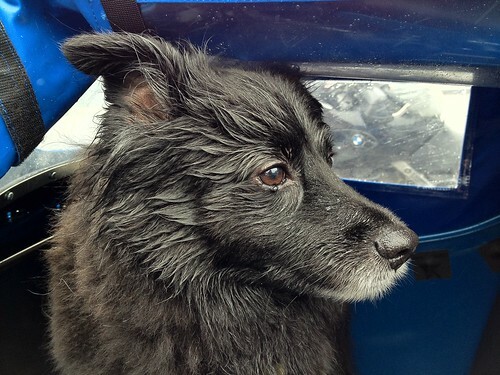 We kept the sidecar fully enclosed, which the dogs didn’t particularly enjoy – they vastly prefer it when they can stick their head out and see what’s going by – but it kept them dry. Eventually we hit I-80, which we were to take for something like 180 miles before the GPS gave us any alternate instructions (and I think at that point it was just to stay right onto I-80). So it got real boring, real fast. And right when we got on I-80, we started encountering road works… the first one of which it took us 40 minutes of driving 5-10 MPH to get through. Which is very bad for an air-cooled bike like the Ural. At one point, we pulled over onto the shoulder and let it sit for a bit because Kay thought the engine was making some odd sounds and we were concerned it might be getting too hot. We bought an IR thermometer to check engine temps on the Ural, since we don’t actually have an engine oil thermometer (it’s on our list of things to buy) so we pulled a temp and the right cylinder was reading around 350 degrees. That’s only about 25 degrees hotter than it was yesterday after a stretch of interstate, so we were a bit reassured, but we waited a bit longer before heading back into the fray. ‘Dido decided to get in on the wet action at one point during the day. When it was only lightly misting, we left one of the side covers up to give them some fresh air. While the insides stayed dry, Bandido insisted on sticking his head out into the wind, leaving him with half a wet face. Needless to say, we rolled that side back down at the next stop. By around 3:30PM, we stopped for an emergency bathroom break and I realized we weren’t going to make it to the campground. We still had around 215 miles to cover at that point. At Ural speeds, we’d be pushing it to make that in 3.5-4 hours… and that doesn’t count the stops to fill up the Ural every 80-100 miles (yes, it’s a gas hog). So it would be after dark by the time we hit the campground. I made an executive decision to just try to get as far toward Anderson, IN as we could (my stop for tomorrow, where I have family to visit) and then try to find a hotel. Kay agreed, so we hit the road again. More rain. At some point in all this, the Ural seems to have had a bump in the power/performance department. It was having trouble pulling up hills yesterday and this morning – going uphill on the interstate, we’d drop from 65MPH down to about 60 or even 55 on some of the steeper inclines – but when Kay was driving it this afternoon, it seemed to be able to maintain a steady speed or to scrub speed more slowly uphill. And on our last few fillups, it seemed to take less fuel! I haven’t crunched the numbers yet, but it seems like the Ural may have hit one of those magic break-in spots where things get a nice little bonus. At around 8PM, we stopped for gas for the Ural and there happened to be like 6 or 8 hotels at this exit… so we decided to call it a day. There was still probably 30 minutes of light left, but we didn’t know how far it would be to find a hotel again, and with 6-8 we had a reasonable chance that at least one would take dogs… so we decided to be opportunistic and call it a day. We’d been on the road for 10 hours. Been up and moving around for 14. And we still had a crap-ton of stuff we wanted to get done tonight. I’m a little disappointed to not be camping tonight, but I think the dry bed and the hot shower (and being able to go to the bathroom in the middle of the night without having to walk the dogs, too) will compensate. Bonus: it totally conceals the bikes. Who needs a cover?